offer breathtaking scenery and wonderful opportunities for the horse riding enthusiast young and old. 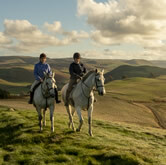 There are some good riding stables in the area around Jedburgh catering for most equestrian needs, with rides and treks through this historically rich, and beautiful part of Scotland. Learn how to ride at Nenthorn Equestrian Center in Kelso.